Omaha scanning system is one person operation poker system. Omaha 4 cards and Omaha 5 cards, Omaha poker game is quite popular all over the world, different countries play different games. Our newest portable Omaha poker scanning system can predict the winners and the ranking of all players in the game before deal the cards. One person can finish all the process and the accuracy is 100%. You can use a scanning camera and a poker analyzer, the magic poker cheating device to help in poker. The stealth earpieces can tell you who the winner is within 0.1 second. The work principle is that the scanning camera scans the barcode marked cards and transfer data to the analyzer, then the analyzer will tell you the winners by the earpiece. 1. Scanning camera scans the barcode of marked cards. 2. Scanner camera transmits signal. 3. Poker analyzer receives the signal. 4. Analyzer will tell you the results who are the first and second winners by earpiece. 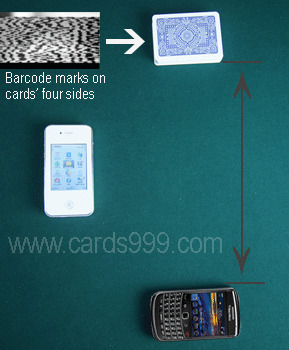 Any playing cards can be scan by AKK CVK MDA poker analyzer, need to use invisible marked cards.